Nutcracker syndrome: A rare and potentially under diagnosed cause of haematuria. Citation: Sebro K, Goetz L, Persaud S. Nutcracker syndrome: A rare and potentially under diagnosed cause of haematuria. Case Rep Surg Invasive Proced. 2017;1(3):4-6. The nutcracker phenomenon results from the partial occlusion of the distal segment of the left renal vein (LRV) as a result of compression of the LRV between the Abdominal Aorta (AA) and the Superior Mesenteric Artery (SMA). Despite modern imaging modalities, the diagnosis of nutcracker syndrome is difficult and requires a high index of suspicion. We describe the case of a 20-year-old female with haematuria, abdominal pain and weight loss. Her diagnosis was delayed but was eventually made on CT angiography after several months and after numerous consultations with several different specialties. Endovascular stenting was followed by complete resolution of symptoms. The nutcracker phenomenon results from the partial obstruction of the distal segment of the LRV as it passes between the abdominal aorta and the superior mesenteric artery. The phenomenon is so named because of fact that in the sagittal view, the SMA and AA appear to be a nutcracker crushing a nut . The nutcracker syndrome, first reported in 1950, is said to occur when the nutcracker phenomenon is accompanied by clinical symptoms including chronic abdominal pain and haematuria . It is a rare and commonly overlooked condition. Despite modern imaging modalities, the diagnosis of nutcracker syndrome is difficult. We discuss a case of nutcracker syndrome with a significantly delayed diagnosis. An East Indian female, 20-year-old, presented to our unit with a two-year history of intermittent gross painless haematuria and constant, severe lower abdominal pain. The episodes were increasing in frequency. There was no association with menses. The abdominal pain was constant and severe. She also complained of chronic disabling fatigue. Prior to her presentation, she had been thoroughly investigated and referred to numerous physicians including 3 general practitioners, 5 gynaecologists, several medical physicians, a psychiatrist, a nephrologist and a urologist. Physical examination revealed an underweight female patient (BMI 18). Blood pressure, pulse and temperature were all normal. On abdominal examination there was tenderness localized to the left iliac fossa but no peritonitis. Urine microscopy confirmed haematuria and cytology revealed no evidence of malignancy. Her complete blood count showed a haemoglobin of 10 g/dl, and all of her other haematological and biochemical parameters including coagulation screen, renal function tests, sickle cell test, were normal. Abdominal X-ray, ultrasound scans and non-contrast CT were normal. She had previously undergone flexible cystoscopy which was reported as normal. At repeat cystoscopy in our unit, an efflux of blood was noted from the left ureteric orifice. 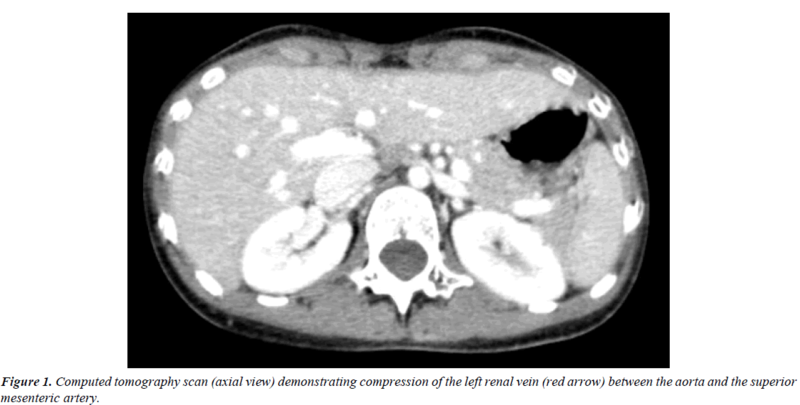 Subsequent CT angiogram (Figure 1) demonstrated partial occlusion of the distal segment of the left renal vein which was compressed between abdominal aorta and the superior mesenteric artery in addition to distended gonadal and lumbar veins. Taken together, these features suggested a diagnosis of nutcracker syndrome. Figure 1: Computed tomography scan (axial view) demonstrating compression of the left renal vein (red arrow) between the aorta and the superior mesenteric artery. Having been counselled extensively on open, laparoscopic and endovascular surgical options the patient underwent endovascular stenting following which her abdominal pain and haematuria resolved completely. Figure 2 demonstrates her stent within a now patent renal vein. At 6 months follow up the patient remained symptom free. 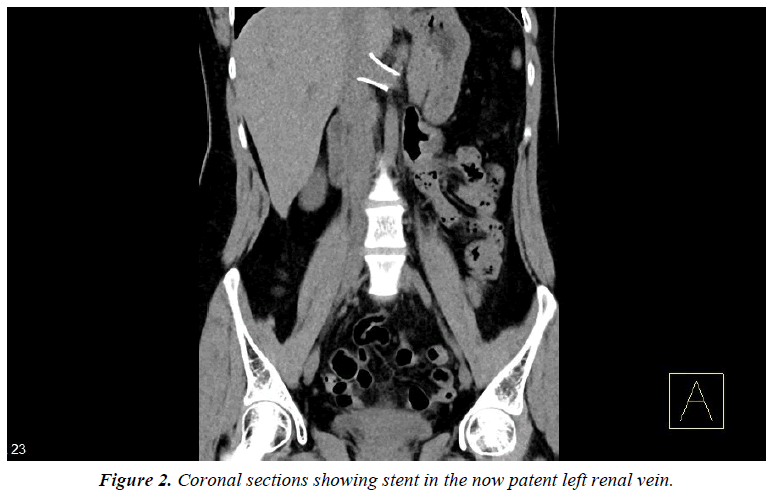 Figure 2: Coronal sections showing stent in the now patent left renal vein. The term nutcracker syndrome is reserved for patients with both clinical and radiological nutcracker features . The prevalence of nutcracker syndrome is unknown  and while not an inherited condition, cases in siblings have been reported . Symptoms vary widely and are often exacerbated by physical activity. These include hematuria, chronic pelvic pain, varicoceles, orthostatic proteinuria and orthostatic intolerance and fatigue [4,5]. Among 51 patients presenting with pelvic congestion, nutcracker syndrome was diagnosed in 9 . Hematuria, both microscopic and gross, occurs as a result of rupture of thin-walled varices into the collecting system. These varices occur as a result of elevated venous pressure [7,8]. Patients with lower body mass index may be at particular risk for nutcracker syndrome as a decrease in retroperitoneal fat is thought to reduce the aorto-mesenteric angle . Cystoscopy may identify haematuria ejecting from the left ureteric orifice . It is important to note that observing the left ureteric orifice for as long as a minute may be necessary to identify this. The diagnosis of nutcracker syndrome is difficult to establish with routine diagnostic methods . Renal angiography may demonstrate delayed venous washout from the left kidney. While intravenous urography and retrograde pyelography are often normal, these may demonstrate notches from large varicosities of the renal pelvis [12,13]. Doppler Ultrasonography (DUS) is useful with a sensitivity of 50% to 78% and specificity approaching 100% [14,15]. While our patient did undergo ultrasound scans, flow characteristics within the renal vein were not noted and should serve as a learning point for future cases. CT angiography and magnetic resonance angiography both have excellent diagnostic yield and may demonstrate development of collateral veins [16,17]. The diagnosis of nutcracker syndrome is established using retrograde phlebography and videoangiography and a reno-caval pressure gradient of >3 mmHg establishes the diagnosis [7,17]. Of note, this test was not available at our institution. The management of patients with nutcracker syndrome must be individualized. Patients intermittent hematuria, insignificant pain and normal haemoglobin may be offered surveillance . Given the good chance of spontaneous improvement with physical development, the conservative approach is appropriate in cases of pubertal patients . Open surgical options include transposition of the LRV or SMA, gonado-caval bypass and renal auto-transplantation . While transposition of the renal vein and auto-transplantation have been linked with good outcomes, SMA transposition and gonado-caval bypass have been associated with higher postoperative complication rate and have sfallen out of favour . Initially reported in 1988, extra-vascular stent utilizing a reinforced PTFE graft is now done laparoscopically . Intravascular stenting with expandable metallic stents is performed under local anesthesia utilizing digital subtraction angiography (DSA) . Contemporary publications have also described good outcomes with endovascular stenting . We opted for the endovascular approach as it is was the least invasive option and is of proven efficacy in addition to the fact that our patient was opposed to the idea of surgical intervention. Although endovascular stenting is an attractive option, it is not without complications. Venous stents may lead to fibromuscular hyperplasia, embolization and proximal migration which may be fatal . Nutcracker syndrome is a rare diagnosis and may manifest in unusual ways. A high index of suspicion is required so that appropriate imaging may be requested. Conservative, open and endovascular options exist for treatment, however patient treatment must be individualized. Kurklinsky A, Rooke T. Nutcracker phenomenon and nutcracker syndrome Mayo Clin Proc. 2010;85(6):552-59. Hearin JB. Duodenal ileus with special reference to superior mesenteric artery compression. Radiology. 1966;86(2):305-10. Matsukura H, Arai M, Miyawaki T. Nutcracker phenomenon in two siblings of a Japanese family (letter), Pediatr Nephrol. 2005;20(2):237-38. Zerhouni EA, Siegelman SS, Walsh PC, et al. Elevated pressure in the left renal vein in patients with varicocele: Preliminary observations. J Urol. 1980;123(4):512-13. Wendel RG, Crawford ED, Hehman KN. The “nutcracker” phenomenon: An unusual cause for renal varicosities with hematuria. J Urol. 1980;123(5):761-63. Scultetus AH, Villavicencio JL, Gillespie DL. The nutcracker syndrome: Its role in the pelvic venous disorders. J Vasc Surg. 2001;34(5):812-19. Beinart C, Sniderman KW, Saddekni S, et al. Left renal vein hypertension: A cause of occult hematuria. Radiology. 1982;145(3):647-50. Beckmann CF, Abrams HL. Idiopathic renal vein varices: Incidence and significance. Radiology. 982;143(3):649-52. Shaper KR, Jackson JE, Williams G. The nutcracker syndrome: An uncommon cause of haematuria. Br J Urol. 1994;74(2):144-46. Weiner SN, Bernstein RG, Morehouse H, et al. Hematuria secondary to left peripelvic and gonadal vein varices. Urology. 1983;22(1):81-4. Hohenfellner M, Steinbach F, Schultz-Lampel D, et al. The nutcracker syndrome: New aspects of pathophysiology, diagnosis and treatment. J Urol. 1991;146:685-88. Chang CT, Hung CC, Ng KK, et al. Nutcracker syndrome and left unilateral haematuria. Nephrol Dial Transplant. 2005;20(2):460-61. Fu WJ, Hong BF, Xiao YY, et al. Diagnosis of the nutcracker phenomenon by multislice helical computed tomography angiography. Chin Med J (Engl). 2004;117(12):1873-75. Takahashi Y, Sano A, Matsuo M. An ultrasonographic classification for diverse clinical symptoms of pediatric nutcracker phenomenon. Clin Nephrol. 2005;64(1):47-54. Wolfish NM, McLaine PN, Martin D. Renal vein entrapment syndrome: frequency and diagnosis: A lesson in conservatism. Clin Nephrol. 1986;26(2):96-100. Shokeir AA, El-Diasty TA, Ghoneim MA. The nutcracker syndrome: New methods of diagnosis and treatment. Br J Urol. 1994;74:139-43. Ahmed, K. Current trends in the diagnosis and management of renal nutcracker syndrome: A review. Euro J Vasc Endov Surg. 2006;31(4):410-16. Tanaka H, Waga S. Spontaneous remission of persistent severe haematuria in an adolescent with nutcracker syndrome: Seven years' observation. Clin Exp Nephrol. 2004;8:68-70. Barnes RW, Fleisher HL, Redman JF, et al. Mesoaortic compression of the left renal vein (the so-called nutcracker syndrome): Repair by a new stenting procedure. J Vasc Surg.1988;8:415-21. Neste MG, Narasimham DL, Belcher KK. Endovascular stent placement as a treatment for renal venous hypertension. J Vasc Interv Radiol. 1996;7:859-61. Policha A, Lamparello P, Sadek M, et al. Endovascular treatment of nutcracker syndrome. Ann Vasc Surg. 2016;36:295.